As the Search and Rescue missions continue in New Orleans following Hurricane Katrina, the celebrities are out in full force trying to help thousands of displaced and grieving Americans. Oprah was on location from Louisiana, Mississippi, Tennessee and Texas and brought in friends Julia Roberts, Jamie Foxx, John Travolta, Chris Rock, Faith Hill, and others to help her Angel Network, which provided millions of dollars worth of goods and supplies. Matthew McConaughey personally rescued over 50 dogs and other animals in a helicopter from New Orleans. Click here to watch segments of the show. 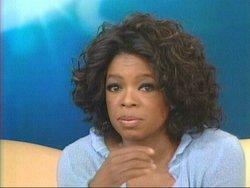 Oprah should run for President.